Preheat the oven to 200º°c. for 15 – 30 minutes. Carefully remove the salmon from the marinade and place it skin side down on a piece of non-stick baking paper on a roasting tray. Place in the centre of the oven and roast for 10 – 15 minutes until cooked. Once the salmon is cooked, remove it from the oven and carefully transfer it to a rectangular serving platter. Combine the salad dressing ingredients and mix well. 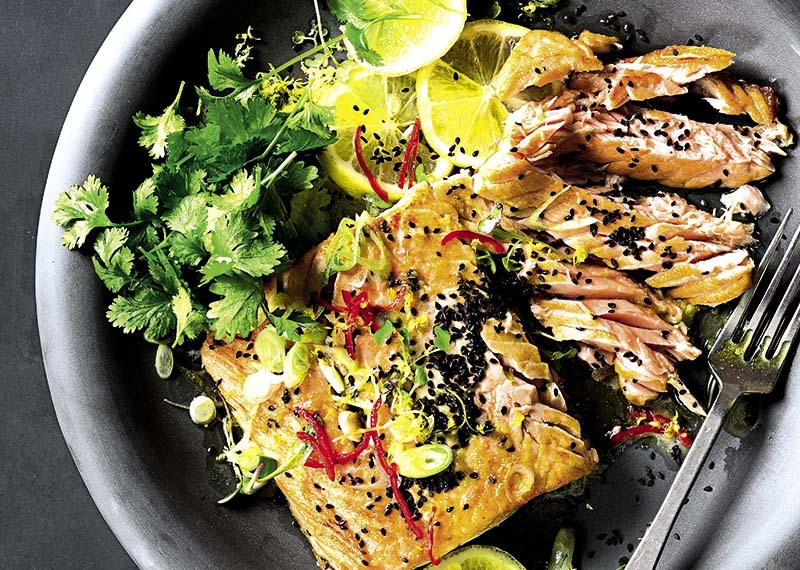 Toss all the salad ingredients, except for the sesame seeds, with the dressing and place next to the salmon on the platter with slices of lime.